Planners and Bible Journaling are two of the biggest new trends this year, so designer members were excited when asked if they'd like to receive product samples to create with from SRM Stickers. Not only clear stickers, SRM has a wide range of product for card makers, scrapbookers, general crafters and makers. 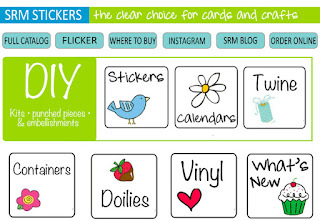 We hope we've inspired you to be creative with SRM clear stickers and stamps. We've certainly had fun creating with them. We love comments, so please let us know which projects you like and share some of your own ideas. If you comment here on this blog, we will pick someone at random to receive a mystery box full of crafty goodness! Good luck! School is out and it's almost summer! Father's Day is just around the corner and it's time to start thinking about Independence Day celebrations! Bottom line - it's time to start making for dad and Uncle Sam. Here are some ideas to inspire...... you're welcome to share yours too!